Rockhill Gardens is a community alive with activities throughout the year, including a community block party, garage sale, progressive dinners, and homes and gardens tours. Dumpster Day - April/May The RGNA board will have three large trash recepticals available for free to members ($5 for resident non-members) from 8 AM until 12 noon on Cherry. Block Party - June/July Food, entertainment and lots of socializing on Cherry from 5-9pm. Contact our Director of Events to volunteer your time or your grill. Progressive Dinner September/October 6 PM to 10:30 PM. 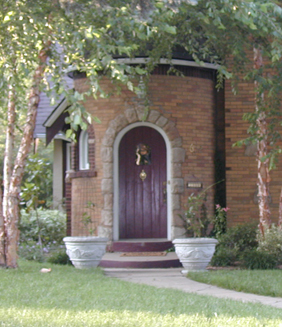 The charm comes out on a resident's castle entry door. Rockhill gardens contains lots of Dible Tudor homes built in the late 1930's.